The files that are stored in Enterprise are normally worked on in the client applications Content Station, InDesign or InCopy. While working on the file, it remains in the Enterprise workflow. This is beneficial because it makes sure that only one user at a time can work on the content, versions are kept in case a previous version of the file needs to be restored, the files can be tracked through the workflow by assigning a status, and so on. In some instances though, the file needs to be taken out of the Enterprise workflow and worked on separately. Example: Sending out PDF files or images to the customer for proofing requires a locally stored version of the file. Tip: Files can also be exported by using Content Station by right-clicking a file and choosing 'Save Original...' or 'Save Preview...'. Note: PDF or EPS files of each page of a layout are automatically stored by Smart Connection when the layout is saved. See Page preview generation. Step 1. 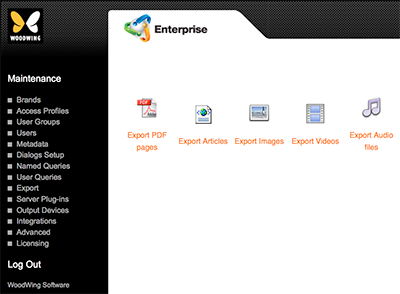 In Enterprise Server, access the Export page. Choose Export in the Maintenance menu on the left side of the screen or on the Home page. Step 2. Click the icon for the file type that you want to export. An export page for that file type appears. 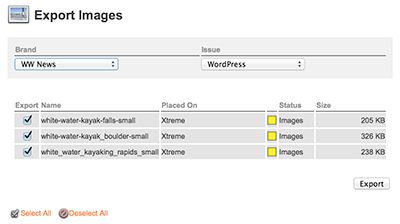 Figure: The export page for images. Step 3. From the Brand and Issue lists, choose the location in which the files that need to be exported are stored. Step 4. Use the check box in front of each file to control if it should be included in the export or not. Step 5. Click Export and confirm that you want to export the files. Information is shown on the page about which files have been successfully exported and in which location they are saved. This typically means that some maximum value has been exceeded such as the maximum upload size. Verify the PHP installation steps. When encountering this issue when using either Chinese, Russian, Korean, or Japanese, set the correct file name encoding for the used language. Note: Be careful with changing this option. When used in a live production environment, “garbled” file names will not be shown anymore; enable this setting therefore only when setting up a new production environment. Step 1. Open the config.php file of EnterpriseServer. Step 2. Locate the Filename Encoding section. Step 3. Enable the command by removing the forward slashes.